One of the lovely things about the film course that I am doing in the Winter and spring evenings is that I don't think I will ever be a movie snob. Over the past 2 years of classes I have seen so many wonderful films of various genres but I think I will continue to love commercial cinema and the importance of movie star as stars. I am thinking of doing a separate movie blog sometime soon. I know I so rarely post on this site but the idea is there anyway. Last year I wrote movie reviews for a magazine based in Kilkenny, my home county. I also complied features for the magazine's books pages so each month I had 4 or more full pages to prepare. If you think there's a lot of work doing a blog post it's a breeze compared to working to magazine deadlines. I reviewed on average 3 movies a month. My review of Up In The Air is here, as well as Alice In Wonderland and Avatar. One of the other films I reviewed was New Moon which I enjoyed even though I hadn't read Twilight or New Moon or seen the first movie. This summer I read Twilight and enjoyed it. It is all about being inside Bella's head and I can see why the books are so addictive for people especially teenage girls who make up the majority of the saga's readers. Fact: v few boys read Stephenie Meyer. Maybe it's like Heat or OK magazine where they read their girlfriend's copy at home. In the bookshop where I work vampire themed books are still among our daily best-sellers, though I wish some of them would discover early Stephen King or Anne Rice. This summer I really enjoyed the Eclipse movie for what it set out to do. It felt like a big movie and while much of it is not original it is a movie for today. I think every reviewer has to regard a movie's target audience and try and see it through their eyes. He or she of course should have their own opinion but good film reviewing is sometimes more than the actual film. It's also about considering that film's place in present popular culture. The American reviewers very often regard film as a business product, good or bad art, an event or simply pure escapism. I read very few film reviews in Irish newspapers, I can almost predict how a film will be reviewed before seeing it. Commercial cinema is very often reviewed negatively while some truly awful art house cinema or films produced in Ireland are overrated. One of the few Irish reviewers that I like to read is John Maguire who writes for a national newspaper here in Ireland. His reviews including Eclipse, which he gives a bad review, are here on his blog Confessions of a Film Critic. While watching New Moon last year I wondered why the soundtrack was so dominated by indie music. A large part of the reason, I would imagine, is because it is the music that Stephenie Meyer herself listens to. The acknowledgements in the book New Moon include a thank you to Muse, Travis, Linkin Park, Coldplay and Elbow. They are all bands I have very little interest in but are all similar bands that you can imagine readers of the books liking or at least investigating their music. Stephenie also has a link to Amazon where you can buy albums she recommends. Big business! The soundtrack for Eclipse is therefore also very indie but one song stood out when I heard it and I like it more each time I hear it now.. I didn't even know who sang it when I heard it during Eclipse which shows the level of my interest in that genre of music. That song is called Let's Get Lost. 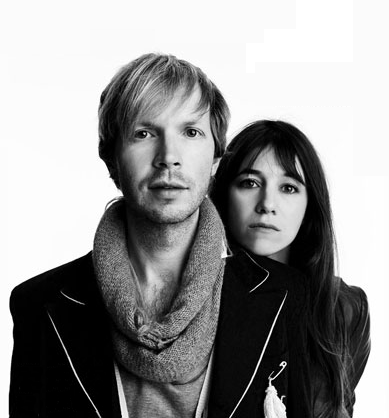 It's by the very well known Mr Beck and Miss Bat For Lashes. When Britney met Rihanna and Usher too!